Every time I think I have a firm grip on the pulse of underground metal, yet another band springs up and smacks me in the face. There is so much talent out there to be found it's insane. For every band I discover I wonder how many others slip through my fingers? Well here is one German band that isn't going to escape. 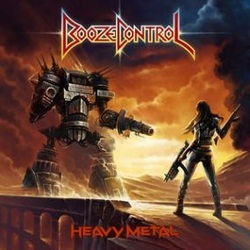 Booze Control has been around since 2009 and they have one previous release that they put out in 2011 which I need to hunt down. Without knowing the music on the first effort, I will have to say that this CD has that NWOTHM feel to it with a touch of a speedy feel on the side (though they really aren't a speed metal band they have the feel of one). The production is decent if unspectacular and definitely solid enough for an independent release. The tunes are pretty basic, solid writing though not exactly heavy on the flair. They are a band living on their influences and are not seeking to make something insanely original here, but just to make some well-written fun metal and I can get behind that! A couple of the songs don't quite hit me with the same luster as the bulk of the album does, but I find that each time I revisit the CD I find more little nuances that I missed the first time through, so the writing is subtle but strong. David Kuri's vocals are a bit distinct and it takes a listen or two to get used to them, but after a bit you get used to it and it adds to the charm of the CD in the long run. The vocals definitely fit the feel of the album well. Some of my favorite tracks include Outlaw, Thunder Child, Hellspawn, Swim With The Shark and Strike The Earth (which admittedly I wasn't too impressed with originally but it really grew on me over time). In a very tightly packed group of New Wave Of Traditional Heavy Metal bands, you would be doing yourself a disfavor if you pass up on this band. The band name is very clever and the album art is perfect!